Order your Sailor Four Seasons Ink 20ml Bottle Ink today from FahrneysPens.com. Fine Pens, Refills & Luxurious Gifts – great prices & fast shipping. 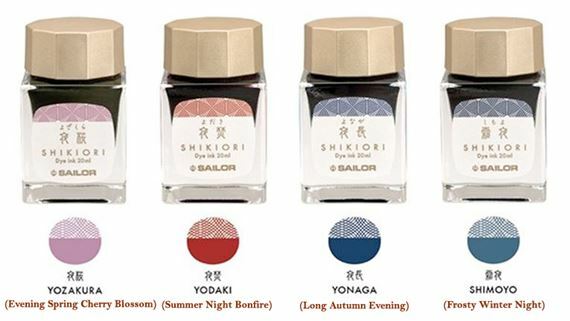 The ever popular Sailor Colors of the Four Season ink series is growing. Sailor just announced the addition of 4 new colors and they are coming to North America! Inspired by Japan’s color-filled seasonal changes, each color represent the four seasons in a subtle and peaceful evening setting: Yozakura (Evening Spring Cherry Blossom), Yodaki (Summer Night Bonfire), Yonaga (Long Autumn Evening), and Shimoyo (Frosty Winter Night). Each comes in a new elegant 20 ml bottle.